Another picture of the snow on Friday. This time, from inside of our apartment complex, which is called the Roman Garden. 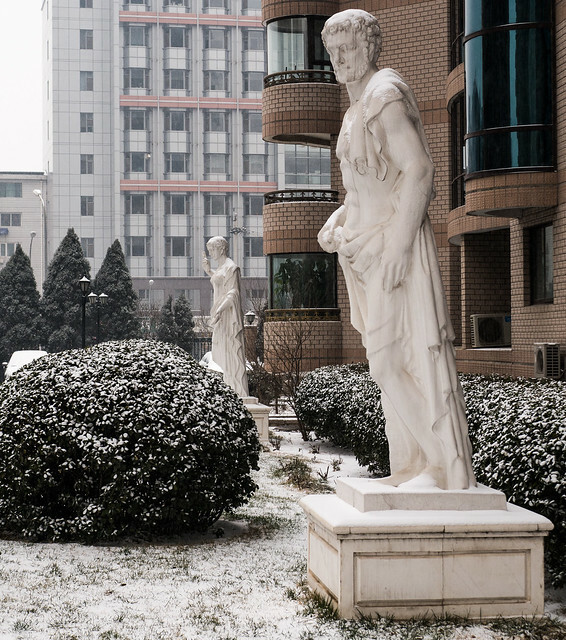 i have never seen a statue look cold before–but these do! hard to know where one is. if you wrote you were visiting italy or greece… do you know anything behind the name and decorations? in arizona, there is always a kachina hotel or a kiva trading post, etc. that, of course, have nothing to do with hopi…absolutely nothing. but, someone must have loved the concept or been enamored of hopi. The complex was designed by someone from Hong Kong. There are Romanesque statutes around the grounds. One of the first high-end Western-style complexes in Beijing (built around 1993).